Vice President of India Dr. Hamid Ansari has re-constituted the Panel for the purpose of making an investigation into the grounds on which the removal of Justice S.K. Gangele of Madhya Pradesh High Court has been sought by 58 Members of Rajya Sabha. As per the new notification Justice R.F.Nariman will head the panel. 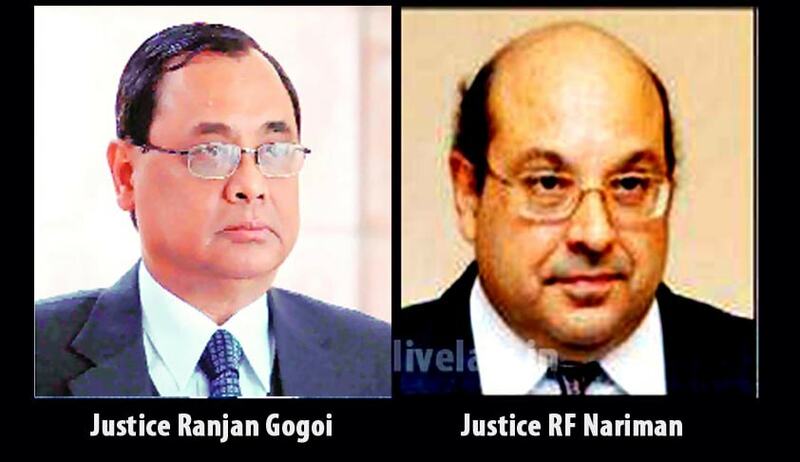 Justice Ranjan Gogoi who was heading panel recused himself from the panel last week. The notification issued by the Rajya Sabha Secretariat Yesterday partly modifies its earlier notification, under Section 3(2) of the Judges Inquiry Act, 1968. The notification had constituted the panel, also comprising of Justice Manjula Chellur, Chief Justice of Calcutta High Court; and Senior Advocate K.K. Venugopal. Justice Gogoi was appointed as head of the Panel on 10th February 2016, when Justice Vikrmjit Sen, who was heading the panel, had retired. In an appalling revelation, the female Judge had alleged being sexually harassed by her administrative Judge. She subsequently had to resign to guard her “dignity, womanhood and self-esteem”. Read the LiveLaw story here. The woman Judge had however contended that until the MP High Court Judge continues to assume his post, the witnesses would not be able to depose in a free and fair manner. She further alleges that one of the two members in the panel had once transferred her and that might lead to prejudice in the investigation. You may read the LiveLaw story here.